Once Upon A Time When Barça Wore White. What if I told you, that Barça players used to wear white kits in the past up till Cruyff’s playing days. It may be old news for Barça historians and fans from that era, but this discovery caught me, and other longtime and new fan, off guard. The Blaugrana’s faithful are unaware of their club’s history of wearing white. Not too long ago, I came across a video of Johan Cruyff leading the Blaugrana onto the pitch in an away match against Aston Villa in the UEFA Cup Quarter-Final back in 1978. However, what caught my eye was seeing Cruyff and the rest of the team donning white shirts. At first, I thought that perhaps those were warm-up shirts but low and behold, Barça kicked off the game while still wearing those white shirts while I was still in a state of disbelief. That image intrigued me and caused me to look deeper into Barça’s use of white in their kits. FC Barcelona began wearing white from the early 1900s when the club’s founder, Joan Gamper was the club’s president. The team wore the Blaugrana shirt with white shorts and also had a white away kit. The team would go on to wear white in different variations up to the 70’s. Furthermore, when Barça was founded, the club used the coat of arms of the city of Barcelona on their shirt as a badge before Joan Gamper decided to give the club its own special crest in 1910. The final time the club wore white was in 1979. Since then, that color has not been used in its entirety and even minor use of it on the shirt has been controversial among the Blaugrana faithful. In the early 90’s, there was controversy after Barça switched from Meyba to Kappa as the kit maker because Kappa’s home shirts had white collars with white stripes on the sides while also displaying their Kappa logo in white. Now a major factor that must be taken into consideration is that it wasn’t until the 50s before the rivalry between Barça and Real Madrid became fiery following the Di Stéfano signing controversy. Therefore, displaying the white color did not carry the vitriol that it would today. It was considered an easy color choice to use against teams that wore dark colored shirts. Moreover, white shirts were also helpful for the television viewers watching a football match on their black and white television sets which helped the viewers differentiate between the two teams. 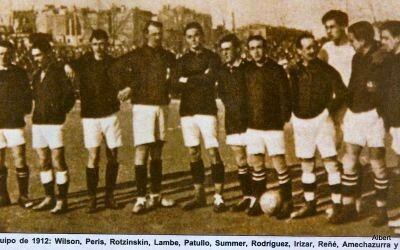 Until 1913, Barça used to wear the Blaugrana shirt with white shorts. Afterwards, the club began wearing black shorts before switching to the traditional navy blue shorts in 1920 while occasionally using red shorts. Although the white shirt was designed to be the away kit, there had been occasions where Barça wore it at home. During the 1946-47 season, they wore the white shirt against Levante at home at their old ground, Les Corts, because it was customary back then for the home team to wear their away shirt if there was a clash of kits with the visiting team. There were other instances of the Blaugrana sporadically wearing the white shirt. 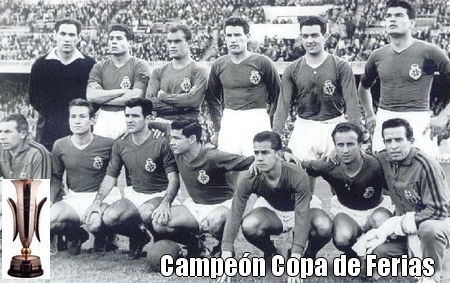 During the summer of 1952, Barça played with a white shirt and blue shorts in the final of the second edition of the Copa Latina. 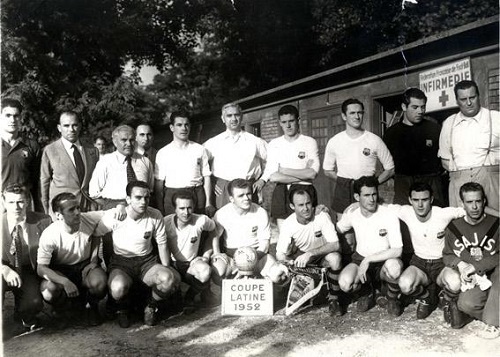 That final was played against Nice, which took place in France in 1952 in which the Blaugrana won 1-0. A few more occasions where the team wore white at home afterwards, but only in European competitions. During the first edition of the Inter-Cities Fairs Cup (before becoming the UEFA Cup and now known as the Europa League), Barça played with the white shirt against FC Copenhagen at their home, Les Corts on Christmas Day in 1955. The reason behind Barça playing with the white shirt on that day was because it was meant to represent the city of Barcelona. Moreover, the white shirt did not have the Barça crest, but instead, displayed the coat of arms of the city of Barcelona. Barça also played in white against Birmingham City, in the Inter-Cities Fairs Cup in 1957, while also displaying the coat of arms of the city of Barcelona on their shirt. The Blaugrana also donned the white shirt in the Champions League, back when it was called the European Cup. 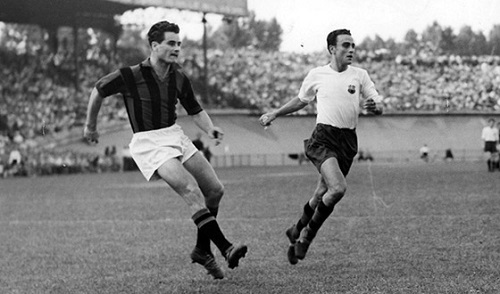 During the 1959-1960 season, Barça wore the white shirt at the San Siro against Milan, on November 4, 1959 (enjoy this brief footage) . The white shirt also made an appearance against Hannover 96 during 1965-66 season in the Inter-Cities Fairs Cup, and again in the San Siro, but this time against Inter during the 1969-1970 season in the Inter-Cities Fairs Cup. 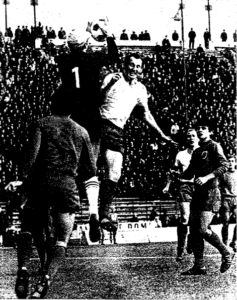 The white shirt also made an appearance in the now defunct UEFA Cup Winners’ Cup in Romania against Steaua Bucharest during the 1971-1972 season. The rest of the 70’s would see the club don the white shirts in UEFA Cup matches. The white shirt were restricted to a few away matches in Hungary and England. 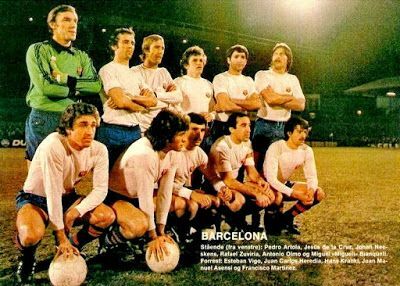 The Blaugrana donned the white shirt away to Vasas in Hungary during the 1975-1976 season. 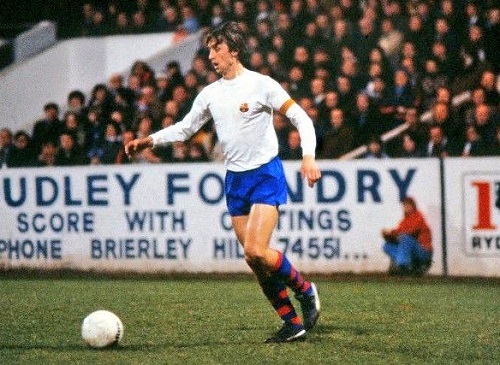 Similarly, Barca wore white in England against Aston Villa and Ipswich Town during the 1978-179 season. FC Barcelona’s away loss to Ipswich Town on on March 7, 1979 would mark the final time the white shirt would be worn by the Blaugrana. Furthermore, the use of white on kits was not just limited to the fooball team. Wearing white was also common for Barça’s basketball team with white shorts being a part of the team kit. 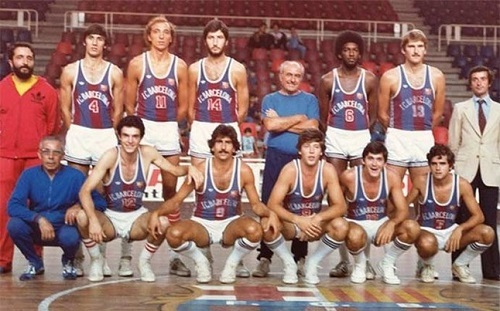 The 70’s, were also the last time the basketball team wore white shorts with their blaugrana tops. Nonetheless, that video of Cruyff leading the team onto the pitch with his captain’s armband on top of a white shirt is an image that will never be repeated in the history of this club. As rare as that sight is, the shirts themselves are also a rarity. Back in 2012, one of the white shirts worn against Aston Villa, belonging to former player Paco Fortes, was put up for auction and was expected to fetch over €18,000. However, I could not find any information on how much that shirt went for. Times may have changed but the idea of FC Barcelona wearing white again is not likely to happen anytime soon. Backlash and ridicule will be expected if the club ever decides to use a white shirt, even if done as a tribute. That in itself, is ironic since nowadays, we see the color white on the front of the shirt for the sponsors and no one bats an eye. For now, the white shirt belongs in the past. Special thanks to Ángel Iturriaga for his input and Míguel Ángel’s blog post well detailed blog about this subject. Also visit www.webdelcule.com for their great content and photos from past and present teams. Next Post10 men Barça battle to a 2-2 draw with Girona.